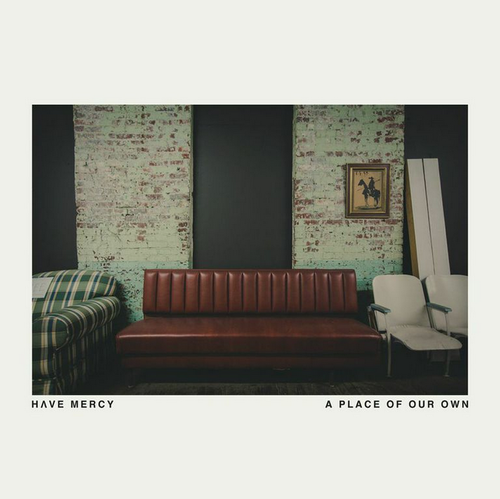 Have Mercy’s new album A Place Of Our Own is something for those stormy days when you’re stuck indoors and need something cozy to listen to. The new album provides a certain comfort behind its woeful songs. There is a turbulence of emotions found melded into refined pop-punk tunes and gritty vocals that depict a sad love story. Hopeless Records must have sensed the hopelessness that Have Mercy brings in their pop-punk, since they scooped up the band for their second album. After catching attention with their first album The Earth Pushed Back, Have Mercy produced their sophomore album with a bit of guidance from record label known for producing pop-punk hits. Have Mercy is staying true to their roots by showing a gloomier outlook on relationships, but A Place Of Our Own shows a more main-stream side with refined guitar melodies, and reengineered vocals. The vocals have taken charge and the guitars are acting as the backdrop. Have Mercy starts off their new album with a short intro track “To Convey”, setting the tone for the rest of their album. Most of the songs have a similar song structure starting with slow, soft vocals easing you into a chorus filled gritty, power vocals and guitars. Melancholic punk drives songs like “Two Years” and “Plastic Covered Furniture” harness the anguish that lead singer Brian Swindle naturally provides in his gritty vocals. A personal favorite is “Pete Rose and Babe Ruth” with its catchy chorus and more pop melodies. “Inch by Inch” is the only track that borderlines between acoustic and alternative playing the softer crooning of Swindle’s vocals. What makes each song unique is the complexity of the lyrics and message behind each song. “Pawn Takes Rook” is almost like a disheartening last plea to make your love see sense. A favorite line of mine is “I’m the pawn and you’re the rook, and you played me like a crook.” It’s simple but memorable. “The Place You Love” is like a private love letter that you happen to be intruding on as Swindle croons the lyrics. Have Mercy have found their place on the shelf amongst their fellow pop-punk bands. While many of the songs sound too similar, the complexity of their lyrics and melancholic pop-punk melodies make Have Mercy stand out from their fellow pop-punk bands. It’s truly a good album, but such impactful lyrics needs to draw their audience in with a little more variety. Again, it’s an album to listen to when you’re inside on a rainy day and you need a blend of pop-punk and cathartic lyrics.